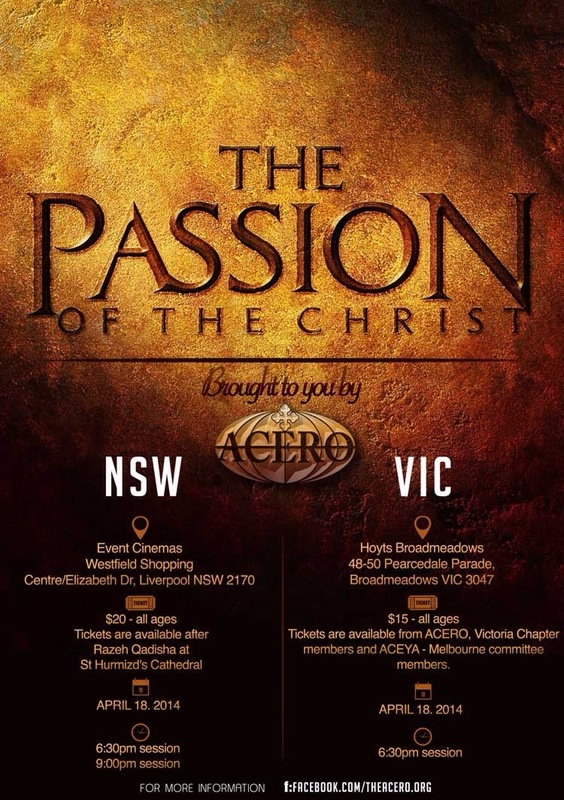 The NSW Chapter of the Assyrian Church of the East Relief Organization (ACERO) have organised a cinema night on the evening of Friday the 18th April 2014 (Good Friday/Roota d’Khasha) at Events Cinemas Liverpool, where The Passion of the Christ will be played in two sessions; 6:30 and 9 PM. Ticket sales are available every Sunday after the conclusion of the Holy Eucharist services at St Hurmizd Cathedral, Ss Peter and Paul Parish and the Youth Association. Please be informed that Holy Raza will be celebrated this Friday (28/2/14) for Friday of the Deceased, at St Hurmizd’s Cathedral at 8:00am. Please be informed that HB Mar Meelis Zaia AM Metropolitan will be celebrating the Holy Raza this Sunday (23/2/14) for the Commemoration of Mar Benyamin Shimun, at St Hurmizd’s Cathedral at 8:30am. This fast is known as Rogation of the Ninevites in English, Ba-oota D’Ninwaye in Syriac. It is a three day fast observed by the Church’s that follow the East and West Syriac liturgical traditions.This fast is known as the Rogation of the Ninevites as it is based on the Book of Jonah in the Old Testament where God sends Jonah to Nineveh to warn its inhabitants of destruction unless they repent for their sins.A theological and historical discussion with his Beatitude Mar Meelis Zaia AM, Metropolitan of the Assyrian Church of the East Australia, New Zealand and Lebanon. Monday and Tuesday: Prayers at 8:30 – 11:30am. Wednesday: Prayers at 8:30am, and Holy Raza at 10am. Thursday: Holy Raza at 8:30am celebrated by HB Mar Meelis Zaia AM Metropolitan. Wednesday: Prayers at 7am, and Holy Raza at 9:30am. Thursday: Holy Raza at 8:30am. Wednesday: Prayers at 6pm, and Holy Raza at 7pm. Monday, Tuesday and Wednesday: Prayers at 4:30pm, and Holy Raza at 5:30pm. Preaching in Arabicon Tuesday at 7:30pm. Sunday school would like to announce that registrations are open for parents who wish to register their kids for the Sunday school at St. Hurmizd cathedral. Sunday school classes run during the Holy Raza every Sunday. For more information, please contact the teachers at the school. Please be informed that HB Mar Meelis Zaia AM Metropolitan will preach on Monday(3/2/2014), 7:30pm at St Hurmizd’s Cathedral.